SAN FRANCISCO, CA. — 49ers quarterback, Colin Kaepernick, along with former teamamte, Alex Smith, who is currently the quarterback for Kansas City Chiefs, will appear at the same autograph event scheduled to be held on April 17-19 at the San Francisco Collectors Show at the Cow Palace. Source: San Jose Mercury News. Photo shows Colin Kaepernick signing autographs at a Tristar event in 2012. 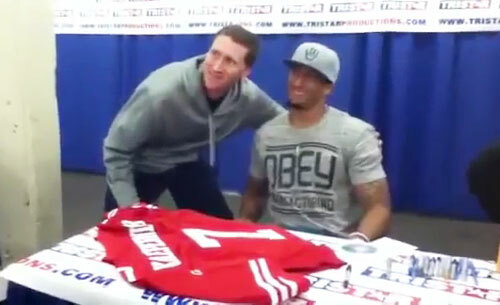 Photo shows Colin Kaepernick meeting with a fan at a Tristar event in 2012. Fans will also be able to meet former quarterbacks Joe Montana, John Brodie and Y.A. Tittle. 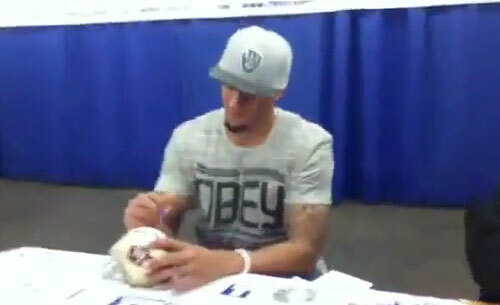 Watch video of Colin Kaepernick signing autographs at a TriStar event in 2012. Colin Kaepernick is the current quarterback for the San Francisco 49ers. In 2012, he replaced the injured Alex Smith and led the 49ers to their first Super Bowl appearance since 1994. If you would like to book professional athletes like Colin Kaepernick for a speaking engagement, autograph signing, product endorsement, fundraiser or special event, contact Colin Kaepernick’s booking agent for appearance fees at Sports Speakers 360. For booking agent and fee information on how to book San Francisco 49ers players for appearances, call 1.855.303.5450.